Laws begin as ideas. These ideas may come from a Senator or from citizens. Citizens who have ideas for laws can contact their Senators to discuss their ideas. If the Senators agree, they research the ideas and write them into bills. 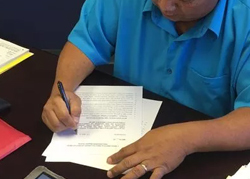 A Senator desiring to introduce a bill sends an initialed copy to the Clerk of the Legislature, who will number the bill in the order of its filing. The Clerk transmits the bill to Management Information Systems (MIS) for posting on the Legislature's website and to the Committee on Rules, to begin the pre-referral process. In the case of a transmittal of a bill for introduction by I Maga'láhen Guáhan, the Committee on Rules introduces the bill on behalf of I Maga'láhen Guáhan. 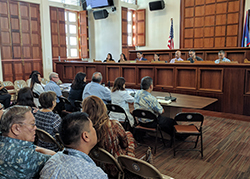 Upon introduction of a bill, the Committee on Rules transmits the Pre-Referral Checklist to the Legislative Counsel and the Office of Finance and Budget (OFB) for their review. 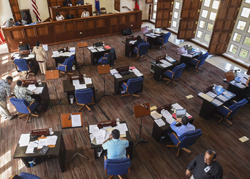 The counsel determines whether a bill conforms to standing rules and the OFB determines if it contains appropriations of funds, authorizations to expend government funds, or provisions that have potential fiscal impacts to the government of Guam budget. The Committee on Rules also performs reviews of bills and determines whether they are in compliance with the Standing Rules as to the authorization of public indebtedness for specific purposes. When the Legislative Counsel determines that a bill does not conform to the Standing Rules, the Committee on Rules will return the bill to its Prime Sponsor, who has the option to correct or withdraw the bill. If corrected, the bill will be indicated “As Corrected by the Prime Sponsor,” and will continue on to the referral process. The Committee on Rules will also return to its Prime Sponsor any bill that contains authorizations of public indebtedness for purposes that do not include land, infrastructure, building projects, any capital improvement projects, and the refinancing of existing debt of not less than two percent (2%) of the present discounted value of the existing debt schedule. Upon completion of the Pre-Referral Checklist and, if necessary, upon submission of a corrected bill, the Committee on Rules refers a bill to the appropriate committee of jurisdiction, in accordance with the Standing Rules. If the OFB determines that a bill contains an appropriation or an authorization to expend government funds, as well as the Committee on Rules determines that the fiscal impact of a bill's provisions are revenue negative, the Committee on Rules will refer the bill to the Committee on Appropriations, in accordance with the Standing Rules. Upon referral of a bill, a committee conducts a public hearing. Public hearing notices are transmitted five (5) working days prior and forty-eight (48) hours prior to the date and time of the public hearing. A committee hears oral testimonies at the public hearing, as well as receive written testimonies. While a bill is in committee, the committee is allowed to make the necessary amendments or substitutions to the bill. A committee circulates for committee vote a report on the bill that consists of testimonies from the public hearing, as well as the findings and recommendations of the committee. Committee members votes to either TO DO PASS, TO NOT PASS, TO REPORT OUT ONLY, TO ABSTAIN, or TO PLACE IN INACTIVE FILE. In accordance with the Standing Rules, bills are not to be placed on the Session Agenda without the necessary number of votes to PASS or REPORT OUT. Committee reports are submitted to the Committee on Rules for review. Once committee reports are deemed filed by the Committee on Rules, the reported bill is available for placement on the Session Agenda. The Committee on Rules meets to decide which bills are to be placed on the Session Agenda for debate by the Members of I Liheslatura. Once placed on the Session Agenda, Members of I Liheslatura can amend or make changes to the original bill. In the Second Reading, members discuss the bills on the Agenda. After discussion, a bill may be placed in the Inactive File or be referred back to the committee of jurisdiction for further study. In the Third Reading, no discussion or debate may be held for a bill. Bills are engrossed, or prepared for voting, in the Third Reading. After engrossment, Members of I Liheslatura vote to pass bills. If a bill does not garner a majority of the votes, which is eight (8) votes, then the bill fails to pass. The Speaker certifies and the Legislative Secretary attests to the passage of bills and transmits them to I Maga'láhen Guáhan. I Maga'láhen Guáhan, upon receipt of a bill passed by I Liheslatura, has ten (10) days to sign or veto it. Once signed by I Maga'láhen Guáhan, a bill becomes public law. Upon expiration of the ten (10) days and if no action has been taken by I Maga'láhen Guáhan, a bill automatically becomes law. If I Liheslatura has adjourned, I Maga'láhen Guáhan has thirty (30) days to act. If I Maga'láhen Guáhan vetoes a bill, I Liheslatura has ten (10) legislative days to override I Maga'láhen Guáhan's veto, which requires ten (10) votes.